Digital transformation is making waves worldwide. Taking advantage of the digital age to grow, to be able to protect companies and gain an edge over competitors is what businesses strive for. However, not all businesses choose the right solution. 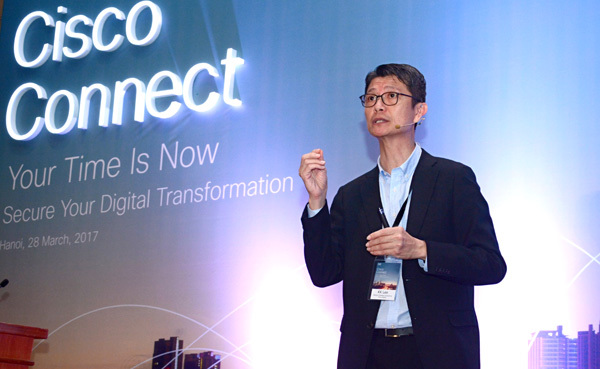 K K Lee, director of System Engineering of CISCO, shares ideas to help business discover the latest trends and technologies, as well as solutions for digital transformation. ■ Most business leaders believe cloud computing is extremely important for their digital transformation strategy. What do you think about this? Yes, it is the natural way forward in terms of technology. Cloud for businesses is not just about the technology itself. It is about the reality, the speed to market. By adopting cloud, the ability to respond to market conditions becomes faster, to be able to develop innovation and optimise operation. It also helps deal with the issue of developing infrastructure, and especially a data centre. For a lot of companies, this is heavy investment because of the cost of real estate here. In certain parts of Hà Nội, I think land cost is expensive. So cloud provides a very good alternative to businesses. Therefore it is a very important development for businesses. ■ What are the barriers for digital transformation in Việt Nam? I think maybe it is not just for Việt Nam but in general. I think the barrier for Vietnamese companies in digital transformation is the internal culture. It requires companies to change their culture from being risk averse to being risk taking. Since it is about transformation of the business process, it is about potentially disrupting what you have until now been doing very well. So from the business perspective, it requires a bit of risk taking. Another aspect is the human aspect. It is a change for employees. The personal change is not easy for employees. It requires a different mindset, a different way of working with colleagues and a different way of dealing with partners and customers. So, both aspects -- company culture and the personal level -- are typically potential barriers for digital transformation. I would not rule out the fact that the barriers are possibly common for all Vietnamese companies. I’m not an expert on the Vietnamese market, but generally across ASEAN and the world, we are seeing the funding environment improve. That means for startup companies, in comparison with five years ago, it is much easier to raise funds, and that also goes for Vietnamese companies. I know in CISCO, we actually track the startup ecosystem within ASEAN. It is easy for startup companies to raise funds to invest in technologies, to participate in innovation and of course to drive new innovation into their products. I want to add in on the barriers faced by Vietnamese enterprises. We referred to common barriers that Việt Nam and ASEAN countries face. For Việt Nam, the main challenge I think is finding qualified and competent people. Nowadays, the Vietnamese government and company leaders are aware of the importance applying IT to business processes to change the business model. But the challenge is whether they have the resources -- the people who can execute this – this is the one of the main concerns of the Vietnamese government and business leaders. ■ Digital transformation is vital for companies’ growth. What technologies does CISCO provide to help Việt Nam and businesses move towards the trend? We provide a lot of technologies to help Vietnamese firms in their digital transformation, not just a single solution. I think for digital transformation, companies participating in the digital journey have to provide three values to their end-customers -- cost, experience and platform value. So CISCO provides technology building blocks to contribute to these pillars of values. For example, in terms of tech costs, it is not just about operational efficiency. It is about automation and determining solutions to respond swiftly to optimise the operation and increase transparency for end-customers. From the experience perspective, it is about customer experience. We have technology that helps companies manage their customer experience. We also have technology for many internal workforce experiences. This is how we work together effectively and the way the collaboration technology comes about. From the platform perspective, we also have software solutions that help our customers build a platform. And on their path to the platform value, they create a marketplace. Depending on how they want to serve their customers, they cannot run away from providing these three values. We have a lot of technologies to ultimately help companies build solutions around providing the three values. CISCO provides multi-dimensional assistance, including productivity, connectivity, operation efficiency and cyber security, as well as analytics and customer experience. We provide solutions to all of this. ■ What are your suggestions for Vietnamese organisations and businesses to protect themselves from network attacks while continuing digital transformation? Cyber security is very important topic. You can’t build something and think about security the next day. It has to start from the very beginning. Security has to be addressed for every aspect of the business model, the selection of technology and during operation. So when you come to security, it is related to the three areas of technology, people and process. I think these are the three main challenges. Cyber security to some companies is a huge challenge because they may have money to invest in technology, but they don’t have the expertise to operate the technology. Moreover, even if you have technology and people, you may not have processes as seen from the best perspective of know-how and the experiences of others. Therefore, only when the three things come together, can you address the topic of cyber security in a very holistic manner. ■ Security is synonymous with innovation and growth as it drives trust and should be a fundamental part of every digital transformation strategy. Can you give an assessment on the network security solutions market in Việt Nam? What solution does CISCO have to enhance competitiveness in Việt Nam? Cyber security in Việt Nam is an urgent and alarming issue. Digital transformation means connecting devices. Therefore, the more we connect, the more we face the risk of security attacks. Việt Nam is one of 10 countries with the maximum risk of network attacks. A report from the Việt Nam Computer Emergency Response Team revealed that in 2016, there were more than 134,000 attacks targeting Việt Nam’s security system. Recently, a series of attacks targeted Vietnam Airlines, Nội Bài and Tân Sơn Nhất international airports and banks. These attacks are called an advanced persistent threat. Most Vietnamese business leaders have realized lack of security is a huge threat. A CISCO survey revealed that 71 per cent of local firms believed they were at risk of attacks while 41 per cent said that they had to halt innovations for development due to the threat of attacks. It is the reason security is a huge concern for both Vietnamese and foreign firms. CISCO has made strong investment in the security issue. Over the past few years, CISCO has acquired many companies. CISCO is one of the leading companies in providing security solutions. CISCO’s growth in Viet Nam's security market has been high, ensuring it continues its investment in the country. One of the main concerns for Việt Nam in digital transformation is acquiring high quality and skilled human resources, as I mentioned above. CISCO has established 19 academies to provide training to more than 25,000 students on security. CISCO is also providing free training to its 500 partners. In the future, CISCO will continue to promote such activities to help Vietnamese firms prevent cyber attacks.